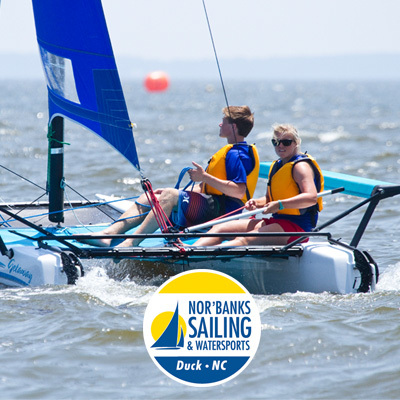 Our staff, equipment, and location make Nor’Banks Sailing and Watersports the Premier Watersports Center on the Outer Banks. Our friendly and professional staff make your visit with us both safe and fun. Our equipment is in outstanding condition and is kept to the highest safety standards. Our location has a grassy lawn, restrooms and showers, 200 foot pier and plenty of room for you to spend the day. Check our event calendar for all of our sailing and paddle boarding events throughout the Summer. Don't forget your bathing suits and water shoes!